“Not Campbell Newman” (@Can_Do_Campbell) was a mystery guest at the Lord Mayor’s Forum in Brisbane yesterday. @Can_Do began tweeting as the fake Lord Mayor two years ago after receiving a car-parking fine which was upheld by City Council: his car was “one foot over the yellow line”. He has gained 3611 followers with his passionate love for Brisbane, and made it clear that he has “no political alignment whatsoever”. “Brisbane’s leadership is important because we have a great city,” he said at the forum, staged before the mayoral candidates’ debate. His hopes for Saturday’s poll are that “we get the best person possible, we have a real leader, someone who cares deeply about the city and will show us some real leadership. Clues to the real identity of @Can_Do_Campbell are few. 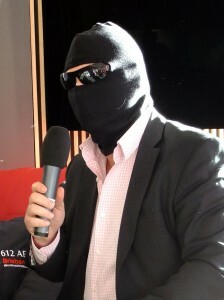 Tim Cox, 612 Brisbane, recognised the balaclava as motorcycle brand, and an earlier attempt to unmask him established that he is known to author and blogger John Birmingham.